suggest fun apps and tools they can use to connect with their customers. One of the reasons I can do that is because I try everything myself. I’ve had a few “oh crap” moments where the results haven’t been what I expected, but equally I’ve had those moments where I find a tool that everyone can benefit from. So you can imagine that when the Word Carnival asked us to pick our favorite tools under $10, I was in heaven. (That was right before I thought: how the heck do I pick just one?). And I’ve got to warn you, that even though I’m known for my integrity, I just might have to cheat on this one. Being no slouch, I grabbed Buffer as my first choice. Buffer is a social media sharing app that costs $10 a month for the premium version (known in Buffer-speak as the Awesome Plan). I’m using the free version, which is still pretty awesome. How do you use it? Once you’ve created an account on the Buffer site, add your social profiles, set a schedule and install the bookmarklet in your browser, then click to choose the sites you want to update and click to share. It lets you share to multiple social sites from a single interface and decide when those updates appear. You can set a schedule for queuing you updates and can also share at other times via the bookmarklet. It integrates smoothly with a bunch of websites (like Twitter) and other apps (like CoSchedule and Pocket) so you can schedule updates from almost anywhere. It provides analytics on your social sharing efforts (these are limited in the free version but still useful). There are lots of other social sharing tools people rave about – like Hootsuite – and they have their place. But having tried several of them, Buffer is the one I have used consistently since the day I first started using it several years ago. Over the period, I’ve seen it evolve to include new sites, better analytics and more integrations. I use Buffer daily (several times daily) and help my clients with it too. When I write content for them and it goes live, I add it to my Buffer so that my online networks see it. This usually brings in some extra comments and shares. 1. Pocket – originally ReadItLater, this free tool works via a browser bookmarklet (and web and mobile app) and allows you to save and tag things you want to read. I use it to save research and articles that might be useful to clients, such as information on WordPress updates and security flaws. 2. Google Calendar/Google Tasks – I use these free tools to make sure I don’t miss deadlines. Give me a deadline and it goes on my task list with separate tasks for starting and delivering articles. I also add appointments for Skype meetings and phone calls. 3. Scrivener – this isn’t free (I paid $30), but it’s where I organize my writing and research and I now can’t imagine writing without it. 4. Dragon Naturally Speaking – carpal tunnel is the bane of writers; Dragon helps solve it by letting me dictate the first drafts of my articles. And – client bonus – I can actually get more work done than when I type, so that’s a win-win. This is the most expensive item on my list, starting at around $80, but it’s totally worth it. So there you have it – my roundup of some of the most useful tools I use in my writing business. You do know your toys, Sharon. 😉 I may have to check out Buffer. I currently use Hootsuite and I use Networked Blogs for scheduling shares. Dragon was one of my favorite tools before I snagged a Mac. Dictate is now my modus operandi of blogging and Scrivener to keep track of all the stuff I write. Back in the day I loooooooved Windows Live Writer. It was how I first started blogging, and it did a fantastic job. Now, Google Docs has taken over – especially for cross-colaborative posts or guess posts so I can share them easily with the folks whose blogs they’ll be populating. Buffer? I’ll take a look. Can you use dragon with google docs? I guess maybe with cut and paste? I dont know. I’m liking google docs more and more, although still use word for long docs with contents. Ah for some more time to explore… thanks for a good list as always. Yes, Anne; you can use Dragon with Google Docs. You used to have to dictate into the dictation box, but I think (haven’t tested it yet) you should now be able to dictate directly. Nice round-up, Sharon. I like Pocket for a whole ‘nother reason: it’s a great place to dump links that I’m not sure I’ll want to remember forever with Evernote! Plus, I get their weekly email with cool articles to read. Being a hermit suits me, because I am not chasing technology. Rather, I am parked on the freelance sites where my prospective clients hang out. That one bit of Internet Marketing advice has been the best take away ever. Twitter made me forget it, temporarily. We’ve got some overlap (I also love Dragon, Google Calendar) but I haven’t become a diehard fan of Buffer or the others…yet. Thanks for the peek into your writing operations, Sharon. Always learn something! I’m loving Dragon 13, Tea – it’s the quickest I’ve been up and running with the new version. Oh wow…thanks Sharon this was really informative! I have been using Buffer more lately for a client and I do like more…I think it’s been improved right…I used it and stopped but I think I am going to make it more of a major tool for me too. I was using hootsuite, but starting not to like it because of an issue I have with a clients FB..Like Tea said thanks for the peak…I was wondering what Pocket was, have not tried and not sure I want to take something new on…but if so, I just may check it out. As I move into this next phase for me…I am definitely going to utilize your advice. Buffer does pretty much everything I want, Michelle. I’ve been hemming and hawing about upgrading, and I probably will one day. You know I hesitated using Google docs for a long time, but now I do all my client work in there (even though I write it in word). It just make so much sense, and the ability to collaborate and comment is unparalleled. Tried Buffer once upon a time, but never became a convert. Maybe it’s worth another round. 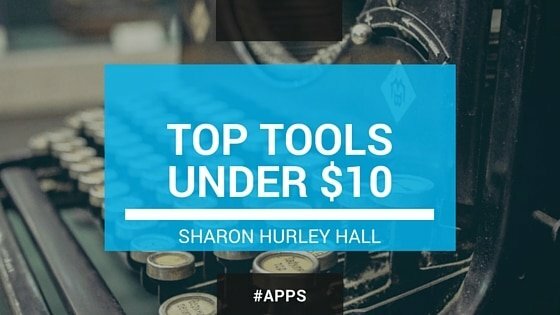 Thanks for these great tools Sharon!! Yes, I love the collaboration, Ashley. I have found that there’s a need for some client education, though. I’m a brand new user of Buffer and I’ve been using Pocket for a while now — love them both. I adore your enthusiasm for tools and apps. And it’s great your vast (and obvious) knowledge base has been a big help to your clients. They’re lucky to have you in their court! I don’t think anyone will hold your “cheating” against you, Sharon 🙂 In fact, I’m really glad you shared all these great tools. Thanks! I’m a big Buffer fan, too and Google calendar is my savior – when I remember to look at it! I know what you mean about typing. There’s no doubt that I think differently when dictating from when typing. That’s why I use Dragon for the first draft and type the revisions. It gives me the best of both worlds, I hope. Of course, Dragon is actually good enough to do the whole thing, but that brain reset is important to my creative process. Getting extra value from a blog post is the kind of “cheating” I can get behind Sharon. I just recently made the full on switch to Google Calendar and it was worth it. If only they would figure out syncing issues between adding new events on my iPhone and Google Calendar online and I would be in heaven. Would second the thumbs up to Dragon. I’ve heard you, and a few others, mention Scrivener before. I guess it’s time to go give it a serious once over. Thanks, Nicole. Scrivener is a great content organizational tool for sure, whether you’re writing a book or a blog. I also use it as a planning tool for my writing schedule. I got Scrivener a while back and I like the “idea” of it but I haven’t been so good at finding practical ways to use it so I usually end up defaulting to Word. Honestly I don’t even like Word except for the spell check but I’m used to it. I used Pages for Mac for a little while and that works WAY better with an actual Mac but the spell check is amazingly bad. It actually can’t correct contractions. In fact, it keeps trying to correct something like “hadn’t” to “hand” and I had to “teach” it not to do that but now any version of either word goes unchecked. Random rant. I have to go back and read your other post about Scrivener and see if I can use it more effectively. Buffer is also awesome. I think the key to these tools is “makes life easier”. And I can always get on board with that! Yes, they have to do something you can’t do better with another tool to make the cut, Carol Lynn. If you’re looking for more on Scrivener, Jenn Mattern of All Indie Writers also has a good review showing how she uses it. She’s as prolific as we are 😀 so that might be useful. Although I primarily use Hootsuite and Sprout Social, I really like Buffer too and use it for my personal profiles. One of the features I love is they give you recommended content to share. Sometimes when I don’t know what to share or don’t have any content of my own, they offer some pretty good recommendations and it allows me to tag those writers and get some extra exposure. Dragon is one I have been wanting to try and just learned from the comments that it integrates with Google docs – that’s pushing me to try it even faster! Thanks, Denisse. I don’t use Buffer’s content recommendations that much yet, as I’ve been trying Swayy, which does great ones! I reckon a good free plan makes you more inclined to upgrade AND to recommend a tool, Michelle. One of my writer friends uses Dragon for iPad and loves it. Dragon is on my wishlist (maybe it’ll be in the Christmas stocking). Never heard of Pocket; you and Mitch inspire me to give it a try.